The online business card… a simple web solution for small businesses! A Quoaklecard is an ‘online business card‘, a smart, single webpage that holds relevant information about your business or organisation. Quoaklecards are designed for small – medium businesses that want a simple, low cost website. The QuoakleCard currently receiving most visits is Days Out in Yorkshire. Here is a link to an example of a Quoaklecard. How much does a Quoaklecard cost? A Quoaklecard costs a one-off payment of £25 (inc VAT) with a annual hosting fee of £25(inc VAT). How can I generate traffic to my Quoaklecard? 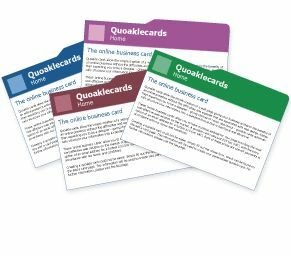 Quoaklecards is a part of Quoakle.com – the graphical directory… the quick link to local websites. Depending on your sphere of business and location, Quoakle.com may be able to advertise your website by posting a link. By doing this you will channel potential customers, specifically interested in the services you offer, to your contact details.